Actually, that headline is a lie. 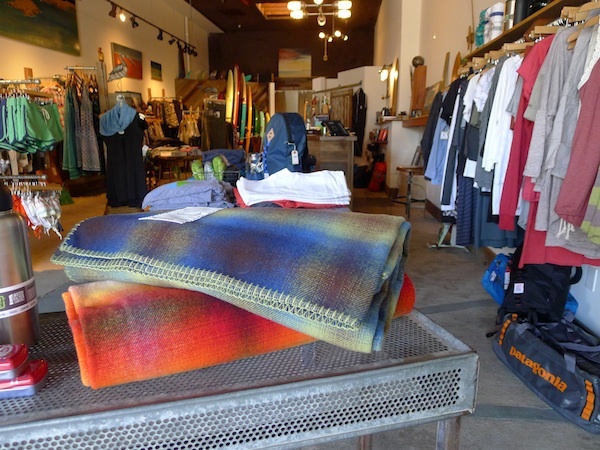 Sawyer Land & Sea Supply in Santa Cruz appeals to much more beyond surfer gals and guys. It’s for travel seekers, weekend warriors, camping comrades, outdoor adventurers, yogis, dog lovers, sea farers, eco-maniacs, Sunset magazine readers, appreciators of local goods and the craftspeople that make them, and even fashionistas (hey what are you going to wear when you’re out in the wilderness?). It’s for anyone who wants to take home a little part of the Santa Cruz lifestyle. Sawyer Land & Sea Supply is less than a year old, but the aesthetically pleasing shop is fully stocked with an impressive list of local designers, rare brands, and well-made goods, resulting in a strong client base. Stacy Forrester, founder of Sawyer Land & Sea Supply, opened the shop to bring together her love of surfing, travel, and the outdoors. As I’m writing this, I keep thinking about that recent report which finds Santa Cruz is one of the happiest places in the U.S. And really, Sawyer Land & Sea Supply does seem to capture some of that happiness. Forrester says on her website, “For me, Sawyer is about doing what brings us joy and inspires us." Well, if that isn’t the Santa Cruz lifestyle in a nutshell. I recently interviewed Forrester to learn more about her shop, starting a business, and her future plans. Be sure to stop by (with your pup!) and check out the shop the next time you’re in Santa Cruz. What made you want to open Sawyer Land & Sea Supply? I was ready for a career change and felt strongly that my store concept to supply quality apparel, surfboards and accessories addressing the Santa Cruz outdoor lifestyle in and out of the water could work. In addition, I wanted to create a venue that would bring a community of like-minded people together to support the arts, music, environmental causes, etc. I spent the last 12+ years working as a sales rep in the outdoor industry. Starting a business isn't easy. Any advice for others interested in pursuing the same path? 1) Write a business plan! 2) Be passionate about your business. 3) Find balance for yourself, otherwise the business will consume you. You own it, it doesn’t own you. What makes Sawyer Land & Sea Supply different from other clothing and surf shops? Sawyer is different in that we blend outdoor and surf creating an offering that speaks to an active outdoor lifestyle. One can find clothing from Patagonia, Prana, Beyond Yoga, Horny Toad, Aviator Nation, Seea, Ibex, Polar, Kuhl, Marmot, Woolrich, Alternative, etc. We also have custom surfboards from Travis Reynold, Ward Coffey, and Ashley Lloyd. Handplanes and Paipos from Long Ship Designs, and Patagonia wetsuits. How would you describe your typical customer and his/her style? Sawyers customers are amazing people with a love for being outdoors. Some of my customers might need to dress up during the week but when the weekend arrives they want to chill and be comfortable. What’s your vision for Sawyer Land & Sea Supply five years from now? An additional door, launch Sawyer’s clothing line; ten years from now ­sell it all and move to a tropical location where I can surf and swim daily in warm water. Any favorite pieces in the shop? 1) Surfboards—they are beautiful and remind me to get out on the water every chance I have. 2) Polar Knapsack: it's the best gift ever, especially going into fall/winter. 3) The local goods ­from Strawfoot bags, Long Ship Designs wood workings, art, jewelry and the Sawyer logo items. Creating a new look for the store with new styles, brands, colors, etc. Bamboo lotion. I don’t know the brand name, but I purchased it after my amazing facial at L’Atelier Day Spa. Be yourself. ­Rock your look, whatever it is. My must-haves for a summer get-away include ­Rainbow flips, a favorite T-shirt, usually a white cotton V-neck, a good pair of jeans, sunglasses, toothbrush, skin trip coconut lotion, shorts, swimsuit, a sweatshirt, light jacket, or denim shirt.